Eldercare Basics is a 203-page ebook with answers to all your questions on every aspect of eldercare, including the questions you never knew to ask. 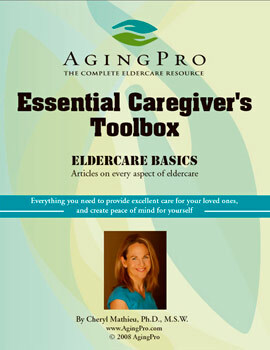 Along with a caregivers manual, Eldercare Basics, By Cheryl Mathieu, Ph.D., M.S.W. includes articles on specialized topics. This book is a one-stop resource with answers on legal, financial, housing, emotional, and practical situations. Answers and resources to all the questions you or your loved ones may encounter while caring for an older loved one. This book empowers you to be the best advocate possible for yourself and your loved ones. "This is a manual you won't want to be without! It has brought me peace of mind and relieved so much stress, so I could focus on being a great daughter, and advocate." Karen C.